Ryan Luza wasted no time finding Victory Lane after his three-race absence, rallying late and passing Ray Alfalla to win at Michigan International Speedway. 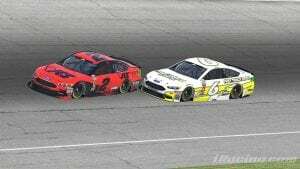 The victory was Luza’s third in the 2018 NASCAR PEAK Antifreeze iRacing Series, but this one involved a fair amount of drama and contact. As the laps wound down Alfalla worked his way by Luza after a restart but Luza had the better long run car and slowly closed the gap. 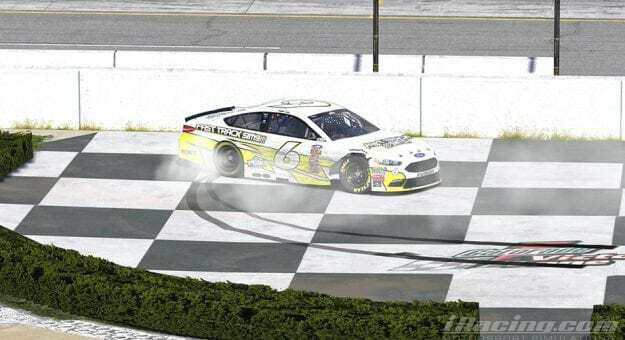 With eight laps to go Luza was right on Alfalla’s decklid as the two headed into Turn One. Luza made light contact with Alfalla in the center of the corner, slightly breaking Alfalla’s momentum as the pair exited Turn Two. Luza looked to the low side down the backstretch but Alfalla threw a block and stopped the run. However, Luza appeared to not take too kindly to the maneuver as he made more contact with Alfalla entering Turn Three, running the three-time champ high out of the groove. The contact was not finished there either as Luza was just shy of clearly Alfalla but came up the track anyway and put Alfalla in the wall off Turn Four. The damage crippled Alfalla’s car and he did well to hold onto sixth. Week Nine takes the NASCAR PEAK Antifreeze iRacing Series drivers to the lone road course of the season; Sonoma Raceway on June 26. The highly technical track is demanding on tires and track position will be at a premium as full-course yellows are disabled in road course races. Last season, Zalenski was dominant while Alfalla and Luza both finished outside the top 20. Will Zalenski show his road course prowess once again, or can a surprising face find victory lane in perhaps the toughest test of the season thus far?